364 days ago, the 2016 Nittany Lions took an unexpected journey. After losing two of its first four games in the 2016 campaign, Penn State rattled off nine games in a row, including a thrilling 24-21 victory over Big Ten East rival Ohio State. The unlikely season turned into a dream season, as the Nittany Lions defeated Wisconsin to take its first Big Ten title since 2008 and traveled to Pasadena for a rematch of the 2009 Rose Bowl against USC. Even though Penn State narrowly lost to USC 52-49, this team had much to be proud of, and now James Franklin and this 2017 squad is looking for its first National Championship run since the NCAA sanctions impacted this program four long years ago. On this rainy day, every fan in Beaver Stadium expected the first touchdown to come from the likes of Trace McSorely or Saquon Barkley, but DeAndre Thompkins was the unlikely hero as he scored the first points on a 61-yard punt return in the first quarter. After Thompkins’ return TD, Penn State never relented. 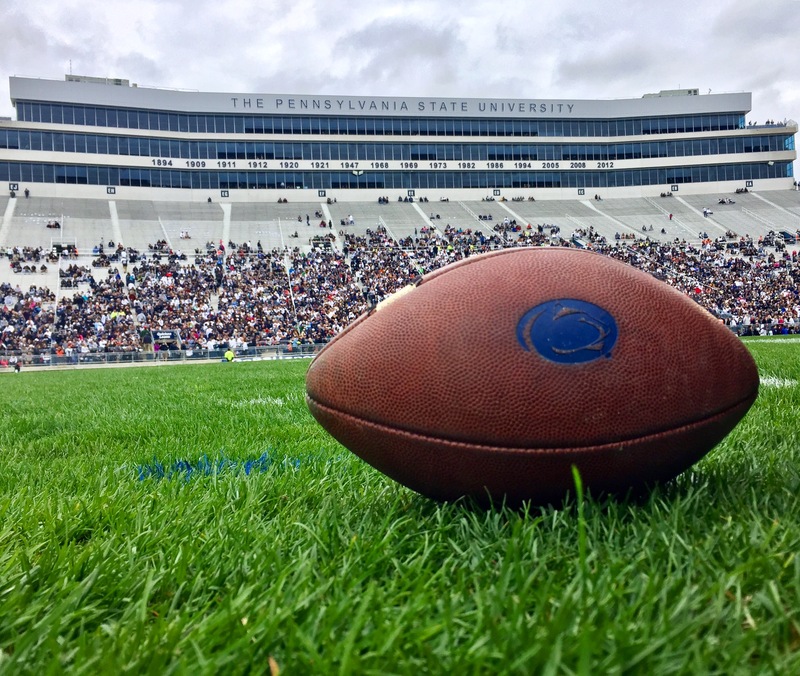 The Nittany Lions capped off the first quarter with a 13-yard touchdown pass to Mike Gesicki to make it 14-0 heading into the second quarter. Saquon Barkley created an electric atmosphere in the second, with an 80-yard run before stepping out of bounds four yards short of the goal line. The play was originally thought to be a touchdown, but the side judge ruled Barkley stepped out. McSorely finished off the drive to make it a 21-point lead. Barkley would get his chance, however, as the Heisman hopeful scampered his way into the end zone twice to put Penn State up 35-0 before the end of the first half. Barkley went into halftime with 145 yards and two touchdowns and averaging an incredible 16.1 yards per carry. Barkley’s day would conclude early in the fourth quarter with 172 rushing yards on 14 attempts, 54 receiving yards on three receptions, and two rushing touchdowns. The second half moved much slower than the first, but still saw some action with another touchdown pass to Mike Gesicki to make it 45-0 and that was the last touchdown for the starters. The second-team came in to score a five-yard run from Tommy Stevens to put the game away 52-0. DeAndre Thompkins looked impressive as he fielded punts in this game. Thompkins ended the game with 127 yards on four returns and did score the first touchdown of the 2017 campaign. Franklin’s belief that the team is now a complete football team and that makes the Nittany Lions even more dangerous on their pursuit to repeat as Big Ten champs, but as we know, James Franklin and this Penn State team will only focus on one thing: Pitt, Pitt, Pitt, Pitt, Pitt, Pitt, Pitt, Pitt, Pitt, Pitt, Pitt, Pitt.